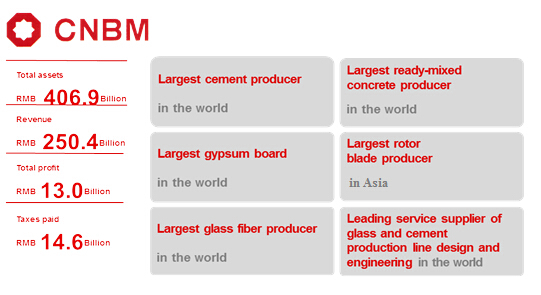 As the leader in China’s building materials industry, CNBM is the largest comprehensive building materials industry group in China. It has been ranked first among the top 500 enterprises in the building materials industry for many years, 50th among the Top 500 Enterprise in China and 270th among the Fortune Global 500. Up to the end of 2014, the total assets of the Group amounted to RMB 406.9 billion and the total number of employees reached 176,854. In 2014, CNBM achieved revenue of RMB 250.4 billion with total profit of RMB 13.0 billion, whilst taxes paid amounted to RMB14.6 billion. 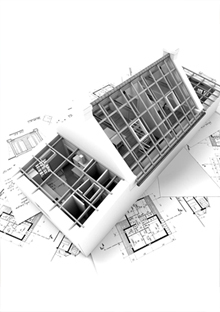 With the objective to maximize corporate value and improve core competence, CNBM has developed into a comprehensive building materials industry group with integration of manufacturing, scientific research and development, set of equipment, logistics and trading, through asset restructuring, business integration and management improvement. Headquartered in Beijing, CNBM has over 1,100 member companies, dominates 6 listed companies, including 2 overseas listed companies. Member companies of CNBM are located in 30 Chinese provinces, municipalities and autonomous regions, whole businesses cover over 120 countries and regions in the world.